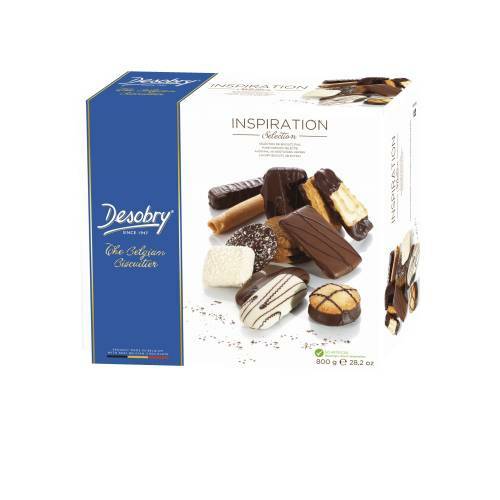 A classic biscuit assortment of Desobry ! Our Inspiration assortment is available in 400g and 800g. Wheat flour, dark chocolate 17,8 % (sugar, cocoa mass, cocoa butter, anhydrous milk fat, emulsifier : soya lecithin, natural vanilla flavour), sugar, milk chocolate 13,3 % (sugar, cocoa butter, whole milk powder, cocoa mass, lactose (milk), emulsifier : soya lecithin), vegetable fats (palm, copra, palm kernel), white chocolate 7,2 % (sugar, cocoa butter, whole milk powder, emulsifier : soya lecithin, natural vanilla flavour), white filling (vegetable fats (palm, sunflower, rapeseed), sugar, skimmed milk powder, lactose (milk), emulsifier : soya lecithin), rapeseed oil, inverted sugar syrup, free range eggs, soya bean flour, butter (milk), coconut, fat reduced cocoa powder (emulsifier : soya lecithin), free range egg whites, salt, dextrose, raising agents (sodium carbonates, ammonium carbonates, diphosphates), skimmed milk powder, whole milk powder, wheat starch, natural coffee flavours (emulsifier : soya lecithin), natural flavours, emulsifier (soya lecithin), natural vanilla extract, cinnamon. Dark chocolate : cocoa solids 46 % minimum. Milk chocolate : cocoa solids 31 % minimum. Low-fat cocoa powder : cocoa butter 10 %. Store in a cool, dry place.